Get an overview of the growing field and trend of creative placemaking, which connects to the desire of artists and communities to embrace art-making in hands-on and communal ways that build stronger, functional and connected communities. The recent UMEZ/LMCC grant opportunity related to this as do grant opportunities with the city and other funders. 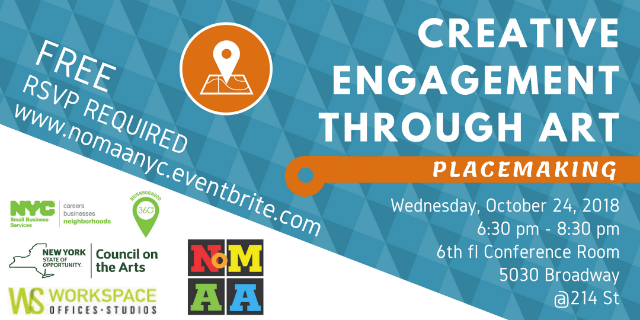 The workshop will largely focus on creative engagement strategies that serve you, your art, your organization and the creative and citizen community at large. Local uptown arts examples will be shared. Results of creative engagement include larger audiences; more donations and purchases; more committed supporters and funders; and energized citizens who sustain the ripple effect of involvement and fully understand the importance of local arts/artists.